Finally it's giveaway time!! This giveaway is a thank you to everyone who has helped me to get over 10,000 views! Thank you SO much for reading and following my blog and watching my youtube videos! 3. Leave a comment on THIS POST just telling me you've entered. You can leave as many comments as you like on this post to increase your chances of winning. I will randomly select a comment that has been left on this post. I will then make sure that the person selected is a subscriber to my youtube channel and my blog. If the person is not a subscriber of both I will choose a different winner :-). The winner will be selected on October 11th, so you have a month to enter! OMG I am fainting.. This has become my dream gift ever. I am loving it so much. 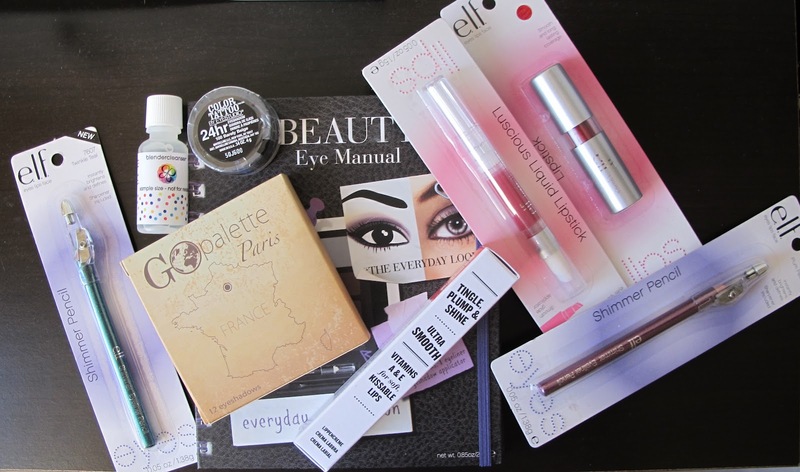 You are giving away all those products that I am crazy for.. <3 Love it love it love it..
Hi, I'd love to win!!! Tick, that's thing number 1 done. And yes, I subscribe to your Youtube channel. It's quite difficult to spell. You need to check you have the right amount of la's and h's when spelling my Youtube name. And of course number 3, commenting. I've been doing that for a bit now. I'd love to try that shimmer pencils as I don't have one. Actually I don't have any elf product.. I am trying my level best not to spam here. So please excuse me if I spam y mistake..
Talking about that eye shadow book. I have seen such books only in YouTube videos or magazines. So it'll be an honor if I am able to try that.. I'll surely do a video if I win all this..
Can't wait to hear who wins!! I know October 11th, is so far away!! Here I am again :) I entered! I LOVE Maybelline Color Tattoos! I would so love to try the limited edition shade in Barely Beige... GORGEOUS color for all over the eyelid (base). Love the look of all these products! I've never tried Elf products. I love the colours in the palette. I love the little guide to the eye looks. I think I'm kinda hopeless at doing my eye make-up so that's is so great! Those shimmer pencils would be great for a pop of color eye look. I love love love love love the Buxom lip creme!